WCW was a more mature professional wrestling promotion than WWF and attracted an older crowd. The WCW fans expected that there would be more extreme matches and less cartoonish personas than WWF. The promotion was perfectly set up to take over from the WWF when the Hulkamania-era kids had become older teenagers. Slowly, the WWF superstars filtered over to WCW and rebranded themselves as meaner, nastier characters. Eventually, Hogan heel-turned and helped found the nWo bully faction with Scott Hall and Kevin Nash who had already been hailed as popular anti-heroes while wrestling for WWF in the early 90s. WCW was for all intents and purposes the same as NWA, but changed names when Ted Turner officially purchased the promotion in 1988 while the NWA was founded forty years earlier. NWA had their own roster of stars that didn't necessarily get rebranded in 1988. The promotion developed under the WCW name and by the late 1990s had won the ratings war against WWF. WCW/NWA started with a single annual pay-per-view event in the early 80s (Starrcade), but every couple of years after that added another event until by the end of the 90s, there was a pay-per-view event for every month of the year. In addition, there were supercard events that were organized to have cards that matched the quality of matches in pay-per-view events. This list is the top ten WCW pay-per-view events and supercards from before Monday Nitro launched in September of 1995. The list is in chronological order with supercards at the end. This pay-per-view event featured a rookie, Sting, who competed in a three-man tag team match with The Freebirds for the opening bout of the event. The third match was a dramatic scaffold match between the Rock n' Roll Express and the Midnight Express. The gimmick is so hazardous that it is difficult to choreograph fluid wrestling, however, watching wrestlers almost fall off the scaffold is always tense and entertaining. The second and fourth matches were both title bouts. The next match was for the tag team titles where two of the Four Horseman (Arn and Tully) went up against the Road Warriors. Dusty Rhodes then defeated a young Lex Luger for the US Heavyweight title and the main event saw Ric Flair in a cage match to win the World Heavyweight title from Ron Garvin. The card was stacked with high stakes matches and featured some of the all time greats in their early days (Sting and Luger). This PPV event featured only Iron Man and Iron Tag tournaments where no titles were on the line. What this means is that only the top WCW wrestlers were featured and wrestled several times during the night. In a sense this is a brilliant gimmick. Imagine a movie could use Christian Bale in multiple roles - it would only increase the quality of the movie and attract a larger audience. The singles matches did a round robin between Sting, Ric Flair, Lex Luger and the Great Muta while the tag team matches did their round robin tournament between The Steiners, Doom, The Road Warriors and the New Wild Samoans. The latter team was a late substitute for the Skyscrapers due to Sid Vicious's injury. The tournament final matches saw Sting face Flair and The Road Warriors against the Wild Samoans. There was even a points system to follow which took into account the different conditions by which a round robin match could be won. The gimmick of the Iron Man tournament ensured that this pay-per-view event only had interesting matches with the best wrestlers and thus made it one of the best WCW PPV events before the launch of Nitro. This pay-per-view event is notable for the debut of Oz (Kevin Nash) and the Diamond Studd (Scott Hall). 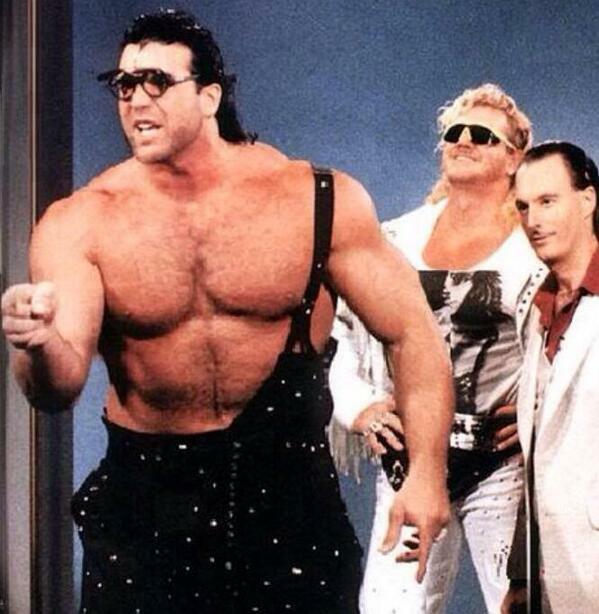 The Diamond Studd was an early iteration of the Razor Ramon character and also a far cry from Scott Hall's early appearance as Big Scott Hall. The Oz debut was fascinating because the fans absolutely hated it. They had disdain for the parodying of the Wizard of Oz story. I suppose that the blue-collar crowd thought that sweet musicals was antithetical to their gritty cultural values. 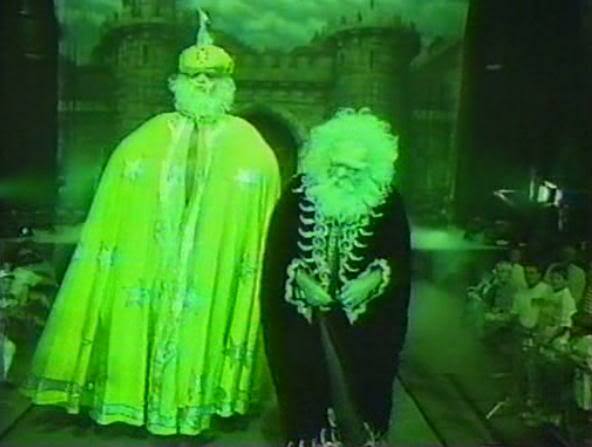 Additionally, they may have been protesting that the gimmick seemed cartoonish and was thus more appropriate for WWF. However, the presentation of Oz was actually quite ominous and the massive figure of Nash was heightened through his wearing of a mannequin head and giant cloak costume. His match ended quickly with his victory. The jobber had no chance against the behemoth and the finishing move was dramatic and one I have never seen before. Yet, the spectacle fell on blind eyes so to speak. The crowd was unmoved by Nash's performance. Other noteworthy matches in this event included a tag team match with the Steiners facing Lex Luger and Sting. Lex Luger and Sting were a dynamic tag team in the early days of Nitro. El Gigante faced Sid Vicious in a singles match that ended quickly. There were other matches on the card worth watching but the event is most important in the history of wrestling for Nash and Hall's contributions. Part of what made Halloween Havoc 1993 one of the best WCW PPV events was that the matchups made a lot of sense. 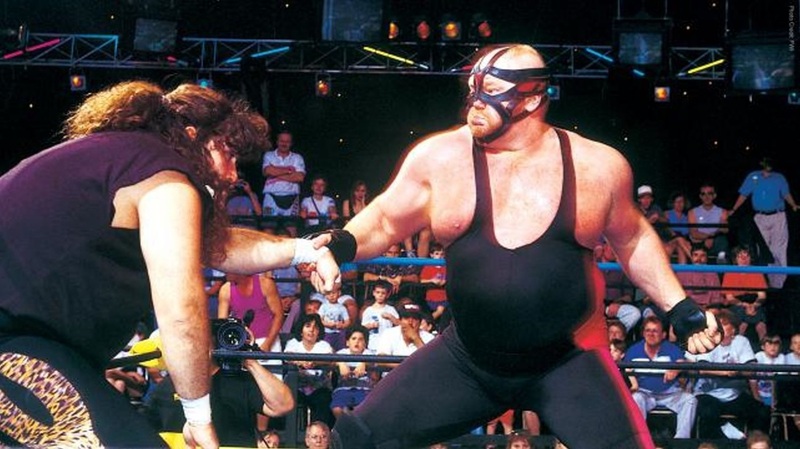 The main event featured Van Vader versus Cactus Jack in a Texas Death match - both wrestlers were burly men with one being capable of dishing out extreme punishment while the other could take it. Rick Rude faced Ric Flair in a title match. Two super egos were well matched as we found out which was the dominant vice - obnoxiousness or arrogance. Sting faced Sid Vicious - both perennially popular wrestlers in WCW. Steven Regal faced the British Bulldog which negated the cheap heat of the crowd booing the foreigner and the crowd got to see whether technical wrestling trumped power wrestling. There were other exciting matches in this event marking it as one of the best. This event certainly wasn't great for the quality of its card. There were some interesting matchups, but most of the matches dragged on for too long. However, the whole experience was made a lot less painful because at this time WCW had contracted both Bobby "The Brain" Heenan and "Mean" Gene Okerlund. Their veteran know-how was aptly employed to improve the experience of all the matches. Heenan could make watching a pot boil exciting if he called it. 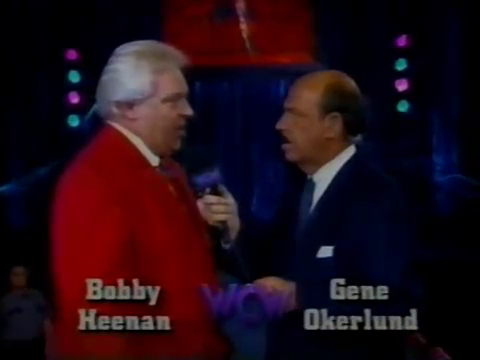 There was a sense with the addition of Okerlund and Heenan that WCW was on the cusp of greatness. There was no point in contracting the best non-wrestling personalities in the business if there wasn't an intention to also bring in the best wrestlers. This was the first Bash at the Beach pay-per-view event and a memorable one at that. There were entertaining matches including an exciting title match between Steve Austin and Ricky Steamboat and a tag team match between Pretty Wonderful (Roma and Orndorff) and Cactus Jack/Kevin Sullivan. 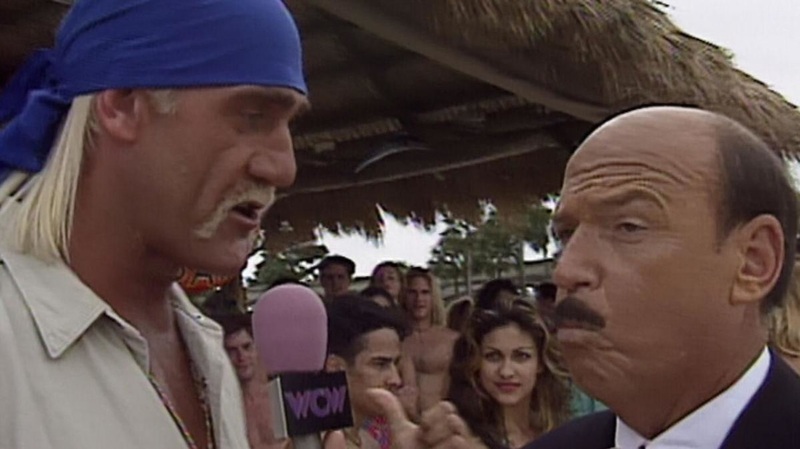 However, what made this pay-per-view event one of the best in WCW during the pre-Monday Nitro era was that Hulk Hogan made his WCW PPV debut in the main event. The match was between Hogan and Ric Flair for the World Heavyweight title and included two of the greatest managers in Jimmy Hart who accompanied Hogan and Sensuous Sherri who was at Flair's ringside corner. The match was high-energy but the outcome was totally predictable. This event is one of the best WCW pay-per-views in the pre-Nitro era because it is fascinating to witness the mismanagement of Paul Levesque (Triple H) as a wrestling talent. He is in the second match of the event facing a rookie, Alex Wright. WCW worked so hard for years to try and have Alex Wright become a big star. He never made it to main events and was even bumped from the mid-card slots for a few years during his maligned wrestling career. His character pandered to the audience, trying to generate cheap pop based on his fresh face and good looks. Yet, his character and look was totally unexciting. 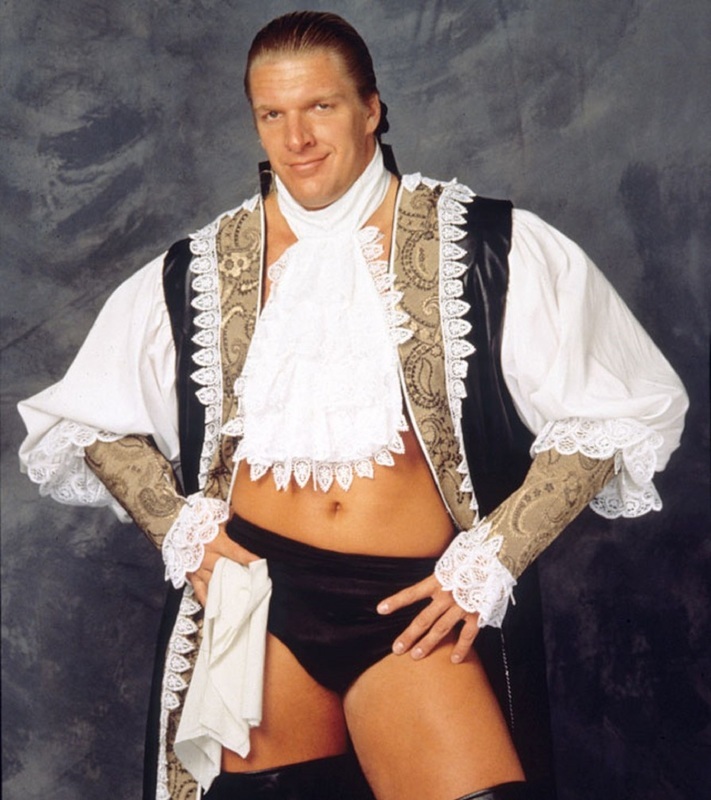 Even Bob Backlund was given a more interesting tweak for his character in the 90s, so why not Alex Wright as well? It is obvious in the match that Levesque is a big, future talent, yet the broadcasting team resists acknowledging the fact. Levesque loses the match and when looking back from what we know now about Triple H, the whole thing seems completely absurd. The other highlight of this pay-per-view is the appearance of Macho Man. Hulk Hogan had joined WCW in mid-1994 and less than a year later the next biggest superstar was joining him. It was exciting times for WCW. Uncensored was a pay-per-view event that focused on breaking the rules of wrestling. Each match had a gimmick stipulation to unsure that there was some extra randomizer to render the outcome less predictable and therefore more interesting. There was a martial arts match with Meng versus Jim Duggan and a boxing match between Johnny B. Badd and Arn Anderson. It was exciting to see wrestlers playing up that they were out of their element. Then there was an amazing tag team match between the Nasty Boyz and Harlem Heat (with Sherri) that ended up in the stands of the arena and in particular beside a set of concessions stands. The concession area got demolished and the wrestlers ended up slipping and falling all over the place as they covered themselves in hot dog condiments. There were several other noteworthy matches including the main event between Vader and Hogan. The uncensored format had a lot of potential but wasn't properly exploited in anniversary editions. This event was the WCW debut for Bobby Heenan. There were several interesting matchups, exciting tag team matches and a main event elimination tag team match with Sting and Ric Flair against Van Vader and Rick Rude. Nitro was launched two weeks after this event. Ricky Steamboat suffered a career-ending back injury during his match against Steve Austin while still managing to retain the US Heavyweight title. During an interview near the start of the event, Hulk Hogan is attacked by a masked man and smashed in the leg with a pipe. Hogan is ushered off to a hospital while the event continues. Hogan is still able to make it to the main event match against Ric Flair. There were other interesting matches including the abominable Meng mauling Dusty Rhodes at the end of Rhodes's match.